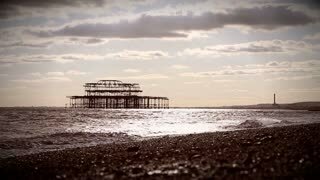 BRIGHTON, UK - 23 APRIL 2015: A family walking among the pebbles of Brighton Beach with the pier visible in the distance and the foreground dominated by a fishing boat. 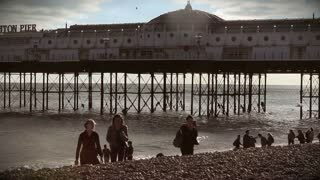 BRIGHTON, UK - 23 APRIL 2015: The main entrance to Brighton Pier, a key landmark in the south England seaside resort, with tourists walking by as they enjoy the sunny weather. 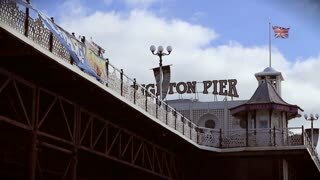 BRIGHTON, UK - 23 APRIL 2015: The entrance to the famous Brighton Pier on the south coast of England on a windy but warm spring afternoon. 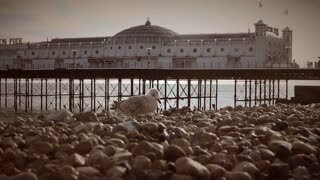 BRIGHTON, UK - 23 APRIL 2015: A pair of teenage girl friends sitting and chatting on the pebble beach in Brighton, UK, enjoying a late spring afternoon overlooking the famous Brighton Pier. BRIGHTON, UK - 23 APRIL 2015: The approach to Brighton Pier's main entrance. 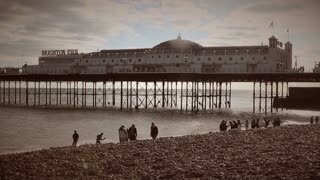 The pier is a key landmark in the popular south England seaside resort. BRIGHTON, UK - 23 APRIL 2015: Tourists browsing a selection of seaside fast food outlets at the entrance to Brighton Pier at the popular south England seaside resort.